Book review by Andrea Bandelli, Executive Director, Science Gallery International, Dublin, Ireland. Art and Science are like two magnetic bodies which we still struggle to conceptualize together. Are they one and the same? Are they colliding disciplines? Or are they two worlds which enjoy occasional, esoteric encounters? Regardless of your own understanding and definition of the matter, the collaboration between professional artists and professional scientists has proven over and over again to be one of the most fascinating and inspiring initiatives that an organisation can support. 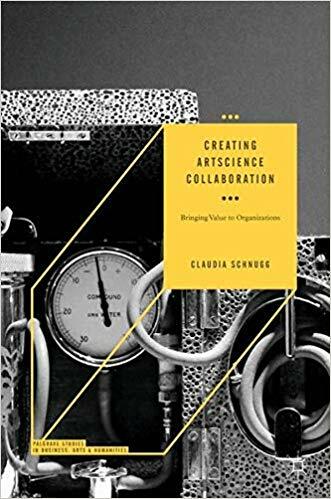 The first part of this excellent book is arguably the most complete and systematic analysis of how ArtScience collaborations benefit the organisations that enable them. The book covers not only scientific organisations, like CERN and its now famous Art@CERN program, but also several industries such as Nokia, Autodesk, and many other which create value by hosting collaborations between artists and scientists. The fascinating case studies explain in detail how such collaborations enable industries to anticipate fundamental breakthroughs and even new regulatory frameworks (such as in the case of precision medicine and robotics, thanks to a project involving creating tattoos with a 3D printer and an industrial robotic arm); or to develop a whole new language to describe new dimensions of research, and therefore, new business opportunities, such as in the case of Nokia Bell Labs and their Experiments in Art and Technology project. Through these case studies, Schnugg builds also a solid theoretical framework to understand and describe several domains where these collaborations create value. Contextualisation, proximity, social networks, sensemaking: these are only a few of the domains described and analysed in detail in the book. One I enjoyed, in particular, is the section on sensemaking, where the case study of Anna Dumitriu is used to show how artscience collaboration are a filter to avoid superficiality, thanks to the sophisticated ways to make meaning that they enable between scientists and artists. Aesthetics and Communication play also an important part in the book, as expected. “Artscience projects are not the design version of scientific communication” writes Schnugg in chapter 8, and this whole section which covers communication, truth-seeking and fake news should be required reading in every course of science communication. The second part of the book is a practical and detailed guide on how to implement such collaborations. This is a goldmine of information for anyone who is interested in bringing scientists and artists together. Chapter 11 contains several detailed descriptions of various kinds of residency programs. These are followed by an incredibly useful list of the “right questions” to ask before embarking in an artscience collaboration. With surgical precision, Schnugg dissects all the elements of a project and creates a checklist which many professionals in this field will find indispensable. Whether you’re an experienced scholar or just starting a project, there’s no better reading than this book to understand the value of artscience collaborations.